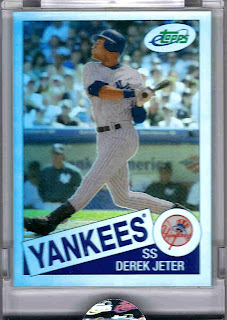 Better known as Todd Uncommon (at least around here), Todd sent along some nice goodies that have certainly found a friendly home here at the Derek Jeter headquarters. Todd included two eTopps cards, one of Jeter and one of Ian Kennedy. He also included a napkin from The Trop. I know it seems weird, but I was thrilled about this. It has become a holder for me for a much-needed item. I love traveling to new Major League baseball stadiums and I have been to a new one every year since 2002. Last year, I visited Milwaukee and Tampa Bay. I bought lots of items for myself while in Milwaukee, including a Gabe Kapler t-shirt for myself and a Ryan Braun one for Marie. However, while in Tampa, I forgot to visit the gift shop and forgot the one thing I get from every stadium I visit - a team shot glass. I have no Rays shot glass and right now the napkin will be a holder for that spot until I visit Tampa again. 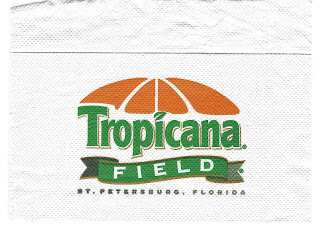 I have a few Trop napkins at home too - if I had known that you wanted them, I would've been glad to send some over. I didn't know I wanted it until I saw it. Does that make sense? Glad you liked the cards. Just wanted to say thanks for the UD and Topps freebies a while back, and be true to my word that I'd send some nice items back to you. Sorry if eTopps cards don't scan so well. As anyone with eTopps experience can tell you, "but they look great in-hand!" I like eTopps, they are fun.